We cannot get away from ourselves. Camp in the savanna and look up at the contrails. Hike the trail by GPS. Climb the mountain and get better reception. You probably got there in the first place following the advice of a way-finding system accurate to the capacity of saying, “The OTHER side of the street, you idiot.” Or maybe you referred to a map that you bought in easily obtainable staple-bound book form at any number of places within a five-minute drive from your house. Or, if that wasn't satisfactory, you went to an office in a state government building and bought a USGS topographical quadrant map that gives you so much detail about your terrain that you know not only every ten-foot change in elevation but every building on every lot, down to sheds and outhouses. And that's all good: Google Maps can show you everywhere on the planet; Wikipedia shares information on every place and culture. But no doubt this rising tide of information can feel a bit overwhelming. No surprise, then, that the days when there were still holes on the maps—when uncertainty still held a post of honor—seem attractive. And now you know almost as much as anyone else in the world about the beginning of Lawson's remarkable journey through what is now North Carolina and South Carolina. The two-month journey produced a book of incomparable observations about the Carolina land, inhabitants, flora and fauna; a map that is widely known, if not much of a cartological advance; and a personal story of adventure and tragedy that ended in 1711 with Lawson’s death at the hands of the native people he had befriended. I stumbled onto Lawson's tale the way most Carolinians do: I wanted to know more about where I was. Interested in the history of my own little piece of ground in Raleigh, I first tried to trace its deed backwards only to quickly land in an insoluble tangle of developers selling it back and forth. So I thought I'd start from the various piedmont Indian tribes, who owned it in 1663 when through the Carolina Charter King Charles II of England first granted it to the eight Lords Proprietors. No luck, but I learned about Lawson’s journey and thought it might hold some clues. Either this is the only existing portrait of John Lawson or there isn’t one. It’s the right time period, the right attitude, the right name, and the right artist, but questions remain (for example, Lawson was never knighted, but the portrait’s history identifies him as “sir”). From the private collection of Elizabeth Sparrow. Used by kind permission. Imagine young John Lawson. In 1700 Lawson was 25, and the well-educated, well-connected son of a physician drifted in London like any young man in any age, searching for a way to make a name for himself – looking for something to do and a good reason to do it. Fascinated by the scientists of the new Royal Society who met at Gresham College in London, where Lawson had attended lectures, Lawson yearned for adventure, accomplishment, notoriety and gain. Which is to say, Lawson was a young man, and it’s easy to understand his interest in the natural world, in science, in discovery. Hooke, Wren and Halley had made the famous coffee house wager that caused Isaac Newton to write his Principia Mathematica barely 15 years before; it was published when Lawson was a teen. The best map of North America looked like an unfinished child's drawing. DeSoto had wandered and died in the southern region of the modern day United States a century and half before, but little mappable knowledge had emerged from his enterprise. LaSalle had done the same around the Great Lakes and Mississippi River during Lawson's childhood with much the same result. So it hardly surprises to learn that when Lawson considered attending the Grand Jubilee in Rome (it was a big deal, a celebration held every quarter century, and honestly, it was something to do) it took only a casual conversation to quite literally turn him around. Lawson saw a lot of cool animals. He describes the turtle grabbing the snake and pulling its head in, the snake killing another snake, and the raccoon going crabbing, using its tail for bait. We don’t think Lawson drew the pictures. Source: North Carolina Collection, University of North Carolina at Chapel Hill. Yet it held no clues about my property’s history because nobody had ever written a book retracing its exact path—which sounded like something somebody ought to do. By 1670 the British had planted a colonial city in Carolina: Charles-Town, on the Ashley River. 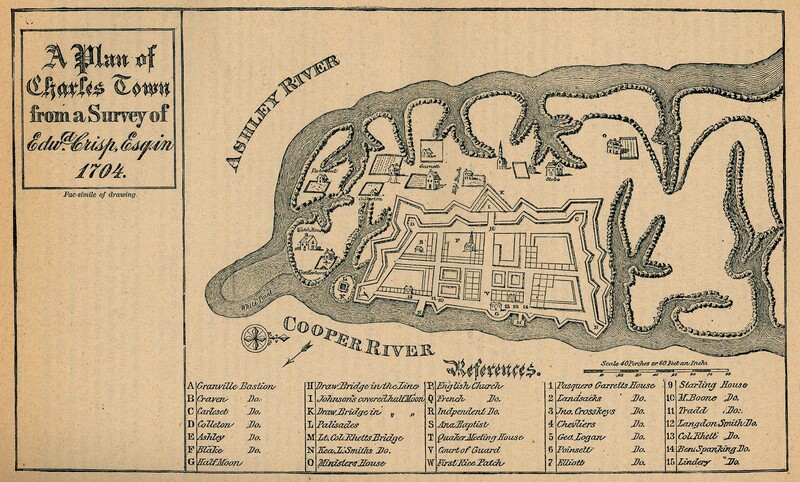 It moved in 1680 to Oyster Point, the spit at the Ashley’s confluence with the Cooper, which made for a more convenient—and not coincidentally defensible—base. Earning its name in the Civil War, the bottom of Charleston is to this day a defensive seawall called the Battery. Lawson certainly sailed there in 1700, and on December 28 of that year certainly set off on a journey, first by canoe and then on foot, that over the subsequent months took him through much of what is now the Carolina interior. Whether he set off because the Lords Proprietors suggested he do so, or because it seemed like something interesting to do, nobody can say for certain, though people have strong opinions on both sides. Lawson, that is, had his eyes open. Unusual among explorers of the time, Lawson understood he was seeing not a virgin continent, but rather the ragged end of a devastated great civilization, ruined by disease, alcohol, slavery and displacement. He described simply what he encountered, and his record is all the more vital (“uncommonly strong and sprightly,” another historian called it) for its honesty. Since nobody has ever retraced Lawson’s footsteps, I plan to do exactly as Lawson did. Not just to slavishly retrace his path, but to look around with eyes wide open, trying to leave preconceptions behind and, with the help of historians, geologists, biologists, adventurers and ecologists, record what has changed in 300 years and what, in another 300 years, those who come after might find valuable to know. Comparing today to the past is foundational to science, and we do it all the time. Recent years have seen scientists return to the observations of Thoreau to document the effects of climate change by comparing the dates of the blossomings and migrations he saw to our current observations; to the works of environmentalist Aldo Leopold to document what he would have heard (Stanley Temple has tried to recreate the sounds he would have encountered in the morning); to the Grinnell-Storer transect of Yosemite to see how the animal populations have changed in the century since the original observations. Climatologists have for years been returning to ships' logs to gather data from centuries ago about wind, temperature and current. I hope, with help from scientists and other observers (and support from the Knight Science Journalism Fellowships at MIT), to add in a small way to that scientific enterprise, and I’m preparing by learning what I can. But I hope much more simply to add to the conversation by seeing, by spending my months in-country as Lawson did, observing what I see rather than what I expect, and hopefully getting people who understand it—scientists, historians, natives, locals—to help me understand. I’ve begun a website, and I’ll update the blog regularly; I’ll post on Instagram, Twitter and Facebook. I think Lawson would have done the same had those tools been available to him. This is a fairly good estimate of Lawson’s journey, though people’s ideas of where he went have changed over time. I expect this one to change a lot as I go. Source: Google Maps, with map points added by the author. We live our lives in the fog of detail, focusing on our appointments and our phones while the universe desperately tries to whisper its secrets into our ears. We think that if we’ve seen things once, there’s nothing more to notice. I like to think of the properly observed life as living as though you were on your junior year abroad, when the kind of ticket you get for the bus, the smell of the funicular railroad, the food a vendor sells, is not just the daily detail you pass by. It’s the essence of life. It’s what the people eat, how they get around, how they adapt to hillside, shoreline, riverbank. It’s what you’ll remember and what you’ll tell other people. I think we should live our entire lives paying attention to things like that. Lawson did. Lawson, a scientist at heart, consciously opened his ears and allowed the universe to whisper to him, and as a result he documented, perhaps better than anyone else of his time, a world that within a few decades had all but disappeared. With a changing climate and rising seas, our own world may be about to undergo radical change, so it seems appropriate to head out to document it. For my first segment of this trip, like Lawson, I’ll paddle by canoe from Charleston to the mouth of the Santee River and upriver a day – about 50 miles in total. Like Lawson, I’m depending on the kindness of strangers and the guidance of locals. There are no holes in the map anymore. The holes in our understanding, however, remain. So we go out into the field and hope to fill those. One awesome thing about undertaking a project like retracing the route taken by someone like Lawson is that amazing people almost instantly begin flinging themselves at you out of the ether. Consider Dale Loberger. A geographic information system (GIS) specialist, Loberger works with Bradshaw Consulting in South Carolina, using GIS to improve people's lives and their understanding of their world -- through systems that connect information with maps (it's not just a fire hydrant; it's a fire hydrant last painted in 2007 and last maintained in 2012; it's not just an address, it's an address with a 17 percent likelihood of generating a 911 call within the next year). That U.S. map showing which NFL team each county prefers? That's a GIS map. Dale Loberger in 19th-century surveyor garb, with a plane table. He has loads of cool stuff like that. Anyhow, I've known Loberger on email for some time -- a mutual friend introduced us when he learned of our mutual interest in old maps and trails. And when I got interested in Lawson, Dale began telling me about his interest in uncovering the old roads in the Charlotte area where he lives: the Great Wagon Road, the Trading Path, and other ancient trails that lead through the area -- trails which Lawson almost surely trod. As someone skilled in GIS, he knew how to take the old maps he was familiar with and link them to modern maps, but he still wondered how he could find his way to the actual spots where the original roads lay. In the seventeenth and eighteenth centuries, Loberger said, something like the Great Wagon Road "was less a name than a description." The Road referred to various ways leading, in general, from Philadelphia in the northeast down into Georgia, generally following the eastern edge of the Appalachians -- and, not coincidentally, the Trading Path, which existed before the Wagon Road, and the animal paths that probably existed before that. Roads were moving-around things in those days before significant paving -- they moved to accommodate new towns, to avoid swamps or ditches, to solve the needs of new kinds of wagons. More, he says, the maps were meant to be nothing like we think of maps now, and returning to old maps trying to get specific pathways from them is a game of "teasing information from maps never designed to give that information." Speaking in an 18th century museum house in Raleigh, Loberger used a highly 21st-century ArcGIS Explorer* presentation while wearing his 19th-century surveying garb (don't worry, he assured me -- he has plenty of eighteenth-century gear more appropriate to Lawson's time). To understand those maps Loberger learned to survey. Most educated men of the 18th century would have learned surveying -- less as a job skill than as a way to truly learn math and computation. (Seriously, every educated man. Surveyor joke: What does a surveyor say when looking at Mt. Rushmore? "Well, there's three surveyors, but who's that other guy?" Teddy Roosevelt was the non-surveying president.) And surely Lawson knew surveying -- in 1708 he ended up as the Surveyor-General of the Carolina colony. Surveying in those days, Loberger has learned, often focused to a level of detail no greater than a single link in a surveyor's chain (7.92 inches) or even a single surveyor's pole (16.5 feet). Once you realize that the original surveyors figured that three person-lengths ("Smoots," to MIT students) was close enough, you're going to feel a little foolish trying to apply your phone's calculation of your position in degrees to 14 decimal points. But not so fast. Loberger didn't give up. "These are not documents of truth," he says of old maps. But "they're documents full of secrets." He reasoned that the roads drawn on early maps were closer to legend images, like picnic tables for parks or big question marks for information centers, than actual representations of specific paths: all they did was say, "Charlotte and Salisbury are connected by road," not "the road from Charolotte to Salisbury looks like this." Just the same, the paths had to exist -- and if they did, they'd do what roads always did. They'd go the easiest way possible from point of interest to point of interest -- village, watering hole, mountain pass -- following the most sensible path: choosing solid places where you can easily ford a creek, following dry ridges where you can avoid insects and moisture plus not constantly climb and descend, traversing open land where you didn't have to wrestle through underbrush. through the brush if they could easily avoid it? Same with hilly terrain -- horses and wagons are just as dangerous on slopes as an 18-wheeler, so Loberger included slope, soil type, proximity to landmarks, and other elements as he began to develop a sort of diagnostic tool for terrain. It ranks places on a 0-10 scale for road suitability. And as he's begun to apply it to old maps and old descriptions -- he hasn't published his results yet -- he's found, at least anecdotally, that his method works. Hoping to come within a mile of somewhere a road's original travelers would have walked, he describes a road he looked for near Charlotte. He found a road that he thought was likely the exact spot and felt certain that, given the uncertainties of old surveying methods and the assumptions of his model, he was probably in the ballpark, within 15 or 16 miles of Charlotte. After he once explained what he had done, someone approached him with a question. "Would you like to see one of the markers?" And took Loberger to a granite stone, marked "XV To C." Loberger wasn't sure whether a Roman "I" followed the "V," but the guy assured him. "That's 15," he said. "I know where 16 is" -- it had been used in a fence. If I had to begin looking for Lawson's trail to bring me finally to Loberger? It's already worth it. Loberger will join us on the trail, probably around Charlotte, and he'll not only help us know exactly where Lawson would have gone but teach us to use the surveying tools that Lawson would have used. This one is called a Gunter scale, named after surveyor Edmund Gunter, who invented it as a sort of pre-slide rule, using logarithmic scales to simplify calculations.Of course Gunter had to become professor of astronomy at Gresham College, where Lawson took classes, because once you start looking for connections that's how it always happens. He was there long before Lawson was, but still. Loberger has tons more cool stuff and ideas, and he'll tell us all about them when he joins us on the trek, probably sometime in the winter or spring. *Oops. I originally called this a PowerPoint. My bad. Dale Loberger's Gunter's scale. I suppose it's possible that stuff gets cooler than turn-of-the-eighteenth-century surveying equipment, but seriously: how? We're hearing a lot about the centenary of the death of the last passenger pigeon -- her name was Martha, and she lived in the Cincinnati zoo, and she died September 1, 1914. Apart from the wonderful discussions found elsewhere -- in National Geographic, in the Times, in books, on video, in various other places -- this is a moment to turn to our own John Lawson as well. Returning to the words of those first observers gives us opportunities to re-gather their data, to see again what they saw and compare it with what we see now. Recent years have seen scientists return to the observations of Thoreau, to document the effects of climate change; to the works of environmentalist Aldo Leopold to document what he would have heard (Stanley Temple has tried to recreate the sounds he would have heard in the morning); to the Grinnell-Storer transect of Yosemite to see how the animal populations had changed in the century since the original observations. Climatologists have for years been returning to ships' logs to gather data from centuries ago about wind, temperature, and current. So it's a sad time to recall the extinction, through pure human madness, of a creature whose numbers once, in passage, would "obstruct the Light of the day." But it's a good time to be returning to the trenchant observations of Mr. Lawson, whose entertaining book will inspire us for months of journeying. I expect to begin our first segment of the journey in mid-October in Charleston, by the way. Stay tuned.